An opener isn't called an opener for nothing. 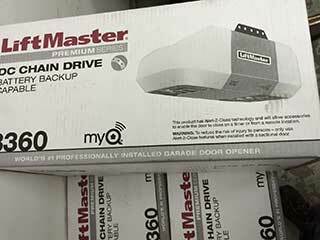 This type of motorized device allows your garage door to move automatically, and affords you the luxury of simply driving in and out without a care in the world. Of course, if this device breaks down for some reason, that glorious convenience will go right down the drain. Don't worry, though. Our team is here to prevent that from happening, or to at least fix the problem as quickly as possible. There are three different types of these electro-mechanical units that exist today. A chain-drive opener uses a chain (surprise, surprise) in order to pull your door open. That makes it strong, and affordable, but also very noisy. A Belt-drive opener works quite similarly, except it uses a steel reinforced rubber belt, which means it is extremely quiet, but unfortunately also a bit more expensive. As for a screw-drive opener, it can be somewhat of a happy medium between the two. Although not silent, it is not as loud as the chain-drive type, and also does not need as much maintenance. The choice ultimately comes down to your specific needs. There are several factors that need to be taken into consideration, such as the backroom space available inside your garage, as well as the weight of your door. Our experts will be more than happy to give you a complete overview of each of the different models we have available. We work with all of the industry's main brands, such as Chamberlain, Amarr and Craftsman, and we can also recommend special features that may be a great benefit, like the Genie Intellicode and the Liftmaster Security Plus. Whether your opener stops working correctly because of a worn out motor gear, a damaged rail system or simply a non-responsive remote, our team at Garage Door Repair Lawrenceville will gladly come and help you out. Call us today.